This blog post is the third in a series of posts on using unsupported functionality in the Oracle JDK and/or Java Mission Control. The following blog entry will describe UNSUPPORTED functionality. This means that relying on the described APIs or functionality may BREAK your code/plugin with any given update of the JDK and/or Mission Control. I strongly recommend against using these APIs in production code. There will be supported APIs for reading reading recordings eventually and they may be quite different to what I show here. Also note that older versions of the parsers are not guaranteed to be forward compatible with newer versions of the binary format. In short, this is NOT supported and WILL CHANGE! You may want to first read the introduction to the JFR parsers and about the relational key before continuing. First off we need a recording to parse. If you have your own favourite recording, you’re all set. If you don’t you can have mine. 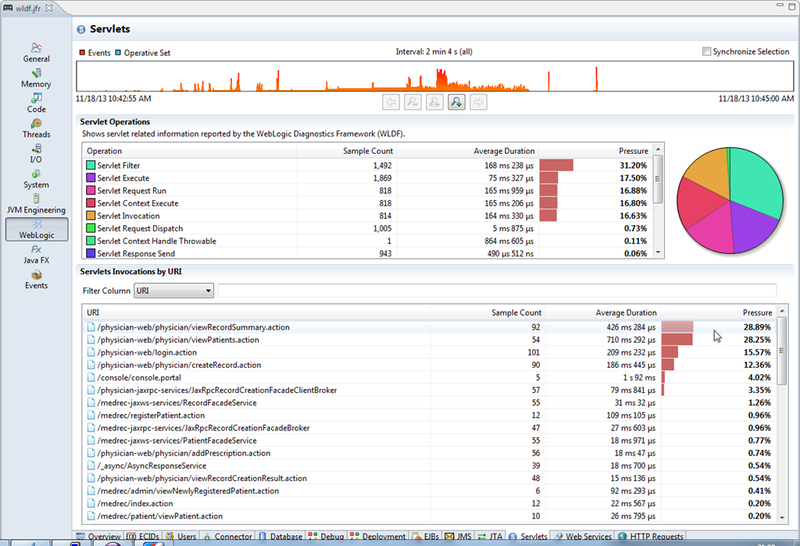 The recording I linked to is a recording of WLS running the MedRec example app with some load. The benefit of using that recording is that it, aside from the standard events, also contains events provided by the Java API for creating third party events (by the WebLogic Diagnostics Framework). Quite useful events, all bound together using the relational key in various ways. Don’t forget to unzip the recording before use. The recording is pretty new and really requires a JMC 5.3.0 with the WLS plug-in for the best result. JMC 5.3.0 has not been released yet, but don’t worry; this blog entry will not even require you to start JMC. Let’s first write a little program that lists the available event types and their metadata. Use the knowledge obtained in the JFR parser blog entry to obtain a copy of the JMC Flight Recorder Parser. Here is a slightly more convoluted example, printing everything out in a nice tree, also showing how many events were found per event type plus some additional stats. It takes a flight recording as its only argument. This blog provided some examples on how to read out metadata from a flight recording and a simple example showing the use of the relational key. This blog post explains the relational key – a little piece of event attribute metadata that is used to associate attributes in different event types with each other. This is a quick break in my series of posts about unsupported functionality, the reason for the break being that you will need to be armed with this knowledge for my next instalment in that series. The relational key is a little piece of event type attribute metadata on the form of an URI. It is normally used as a marker to hint to JMC that it often makes sense to find all events (of different event types) with the same attribute value for attributes with the same relational key. 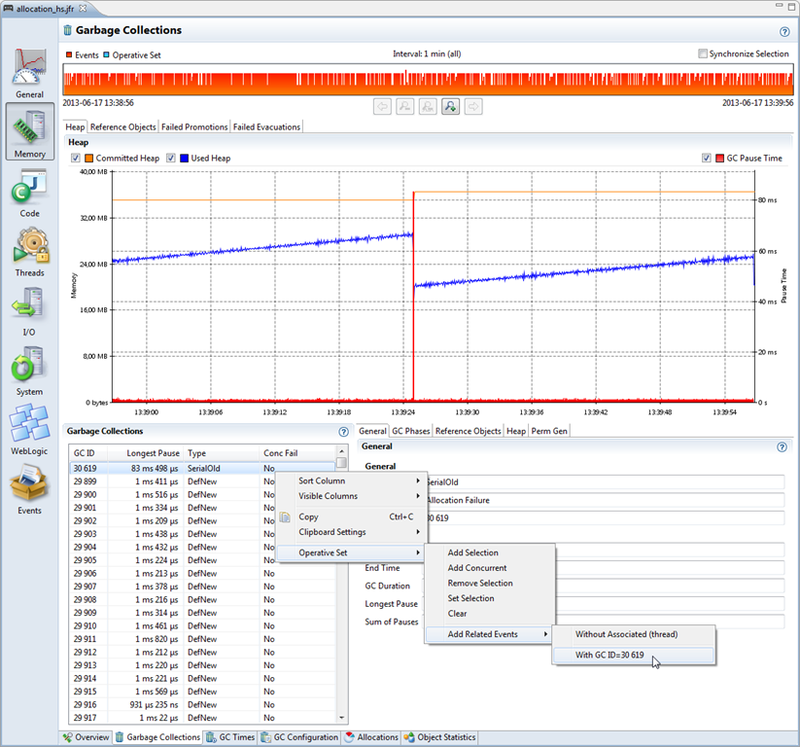 For example, the Java Flight Recorder has quite a lot of different GC events. Almost all of them are related to a certain GC ID. It often makes sense to find all events related to the same GC ID. The picture below lists some common GC events, and their attribute metadata. The relational key can be seen in action in how Mission Control presents the alternatives for the Operative Set. If you go to the GC view, pick a garbage collection and open the context menu, you will find that there is an option to add all the events with the same GC ID to the operative set. 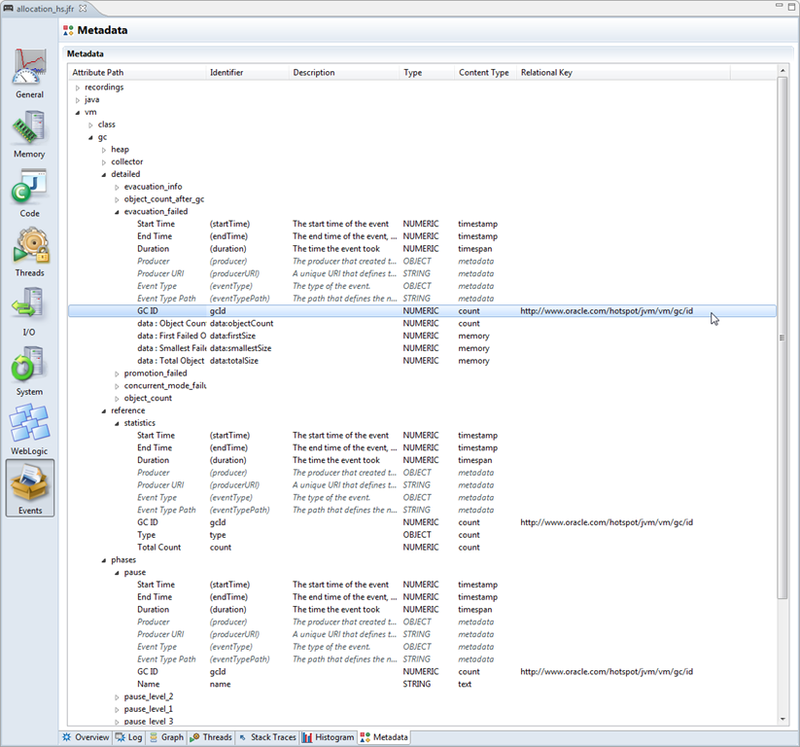 Moving over to the events tab, and selecting to only show the operative set, a range of different events, all associated with that particular garbage collection, can be seen. Another very useful example is the ECID attribute in the events produced by the WebLogic Diagnostics Framework (see the “Putting it All Together” section of my post about the Operative Set). The relational key is a handy little piece of attribute metadata that is used to give hints to the JMC user interface that different event types are related to each other. 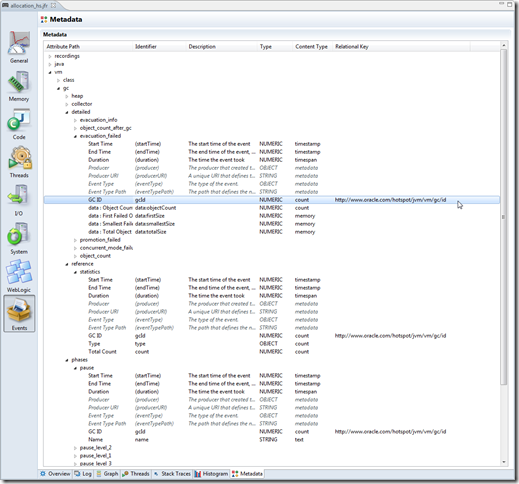 It is used by Mission Control to, for example, control what attributes are listed in the Operative Set context menu. This blog post is the second in a series of posts on using unsupported functionality in the Oracle JDK and/or Java Mission Control. Just as there is no supported way to add custom events to the Java Flight Recorder (yet), there is even less in terms of programmatic support to read recordings. There are however two different unsupported parsers available. Both are POJO APIs, and except for supportability / future API breakage issues, there is in practice nothing stopping you from using either one to read your recordings. I strongly recommend against using these APIs in production code. There will be supported APIs for reading reading recordings eventually and they may be quite different. Also note that older versions of the parsers are not guaranteed to be forward compatible with newer versions of the binary format. In short, this is NOT supported and WILL CHANGE! That said, it can sometimes be quite useful to have programmatic access to flight recorder data. One could, for example, do automatic filtering and/or reporting on recordings, and then use JMC to do detailed analysis on the ones that are flagged as interesting. The reference parser shipped with the Oracle JDK can be likened to a SAX XML parser. It allows you to iterate through the recording, uses little memory, is somewhat limited, and provides a very simple Java model. If your needs are simple, this may be the perfect parser to use. It is available by default in JDK 7u4 and later. The parser API is located in the JDK_HOME/jre/lib/jfr.jar file. I will not spend too much time on this parser. If the reference parser is the SAX XML parser equivalent, then the JMC parser is the DOM equivalent. The jar for the parser is easily nicked from the JMC distribution, either from the update site or from the JDK installation. In the JDK, you’ll find the jar containing the JMC flight recorder parser at JDK_HOME/lib/missioncontrol/plugins/com.jrockit.mc.flightrecorder_<version>.jar. You will also need to add the JDK_HOME/lib/missioncontrol/plugins/com.jrockit.mc.common_<version>.jar to your path. This blog post lists two different UNSUPPORTED parsers that can be used to read java flight recordings programmatically from Java. A very simple example showing how to iterate through the events in a recording was shown for both of the parsers. This blog post is the first in a series of posts on using unsupported functionality in the Oracle JDK and/or Java Mission Control. 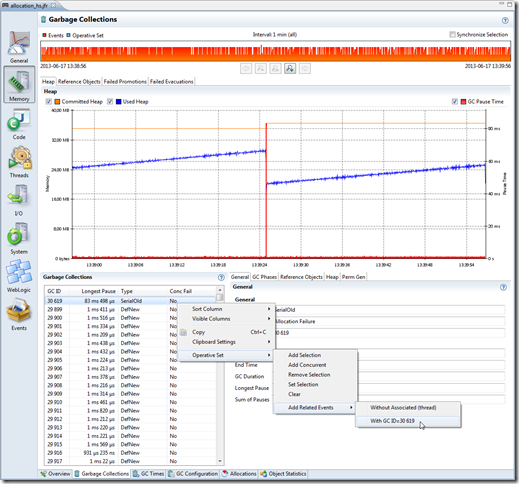 Since the 7u40 version of the Oracle JDK, the Java Flight Recorder provides a wealth of information about the operating system, the JVM and the Java application running in the JVM. To make the wealth of information easier to digest, it can often be quite useful to provide some contextual information to the events available from the Flight Recorder. 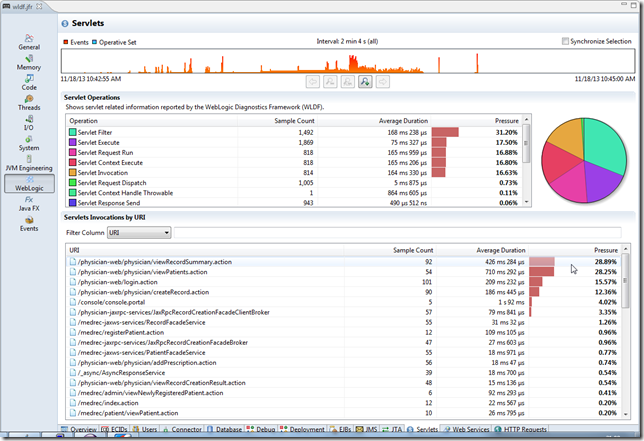 For instance, WebLogic Diagnostics Framework integrates with the Flight Recorder to add information about requests, and there are trial projects that add information about JUnit tests run, JavaFX pulse logger information and more. Having that contextual information makes it much easier to get a good starting point for where you want to study the recording in more detail, for instance homing in on the longest servlet requests taking the longest time to complete. This blog will show how to use the Flight Recorder Java API to record your own data into the Java Flight Recorder. I strongly recommend against using these APIs in production code. There will be supported APIs for recording custom events into the Java Flight Recorder eventually and they will likely be quite different. Also note that code using these APIs will require an Oracle JDK >= 7u4, both at compile and run-time. And finally, note that the entire API for recording your own events entered the Oracle JDK deprecated. This is NOT supported, and WILL CHANGE! Sometimes having this ability can mean the difference between solving a problem in a reasonable time and not. This is an API for recording information. If proper care is taken, you can insulate yourself from the effects of not having the API available at runtime. This will never be the kind of API that is critical to the execution of your application. That said, the API and having access to the flight recorder infrastructure can be pretty addictive if you’re interested in production time profiling and diagnostics. There are plenty of opportunities where you can use this API to a great advantage without even touching your application code. For example, having an event type for unit tests or maybe coding your own BCI agent to insert the code required to emit events on the fly. Getting some early feedback on these APIs would be quite helpful. These are events with only one time – the time the event occurred. 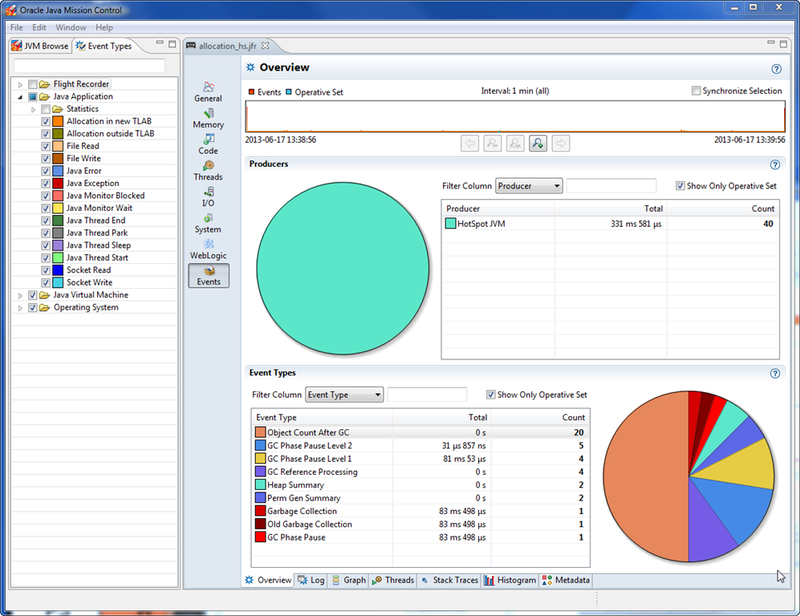 These are events with a user configurable period. These are events that have a start and end time (a duration). These are duration events with a user configurable threshold. If an event has a duration shorter than the defined threshold, it will not be recorded. The producer is basically some metadata and a namespace for your events. In the Java API, you will register your event types with the producer. Once the producer is no longer referenced, your associated event types will be cleared. Do NOT lose the reference to your producer. In event types you define the metadata used to describe the events as well as the attributes (data) available. The producer is simply defined using a name – the name is what will be shown to the user in the JMC GUI, a description and an identifier. The identifier is on an URI format. After making sure to keep a reference to the producer, we can start defining the event types. Construct an instance of the event (or reuse a previous instance, as discussed later). Call the start method to take the start timestamp. Set the attributes you wish to set. Call the end method to take the end timestamp. Set some more attributes if necessary. Call the commit method to commit the event to the recording engine. There is a Java API for adding events to the Java Flight Recorder available in the Oracle JDK since 7u4. It is NOT SUPPORTED, and it will change. That said, it can be quite useful for providing contextual information to the rest of the data provided. I am very interested in feedback on this API. Such feedback will be fed back into a future, officially supported, API.